The Altai Mountains lie in the heart of Asia, at the junction of steppe, desert, and taiga, and constitute one of the most pristine montane ecosystems on Earth. “Circling the Golden Mountains” is an attempt to circumnavigate the Altai by ski and bicycle and to tell the story of this region, its people and landscape, to as wide an audience as possible. Conservation across political frontiers is a world-wide concern, and here in the heart of Asia we find a vital laboratory. 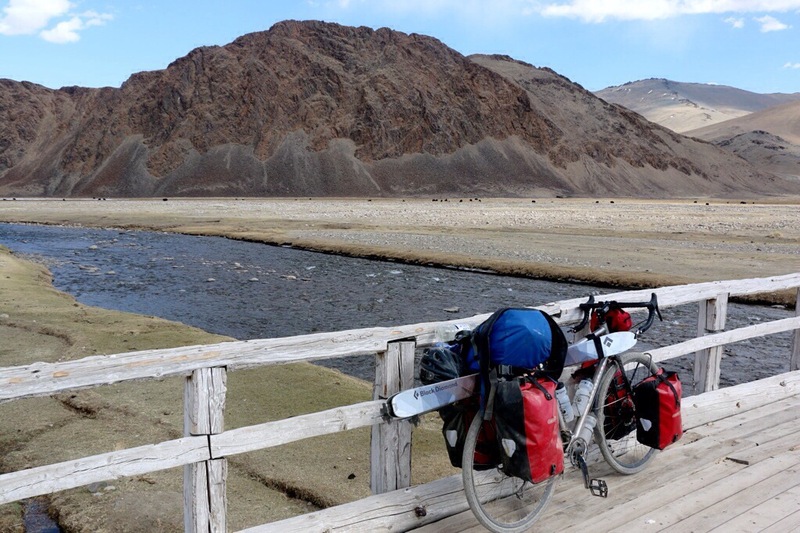 We intend to trace a 4,000-kilometer route through Kazakhstan, China, Mongolia, and Russia, and to carry skis on our bicycles and execute between two and three dedicated multi-day ski tours in each country, with peak ascents and roadside missions as spring advances. We hold an absolute dedication to a light, fast, and low-budget aesthetic, and unless we hold to this style throughout, the route will not be possible. We will cross the path of the proposed pipeline- currently postponed – that Russian oil giant Gazprom is trying to build through a UNESCO World Heritage Site to access Chinese markets. Take a look at the expedition website at and our Facebook page for more information and updates!